My interest in Phoenix history includes everyone. So I do research on everyone, and I write about everyone. Everyone is important to Phoenix history. And no, I don't mean almost everyone, I mean everyone. And a common thing that I hear is that I can't write about Indians because I'm not Indian, or I can't write about women because I'm a man, that sort of thing. And maybe, since most people only write about themselves, and most people who write history are like me, white men, there's a reason that so much important history is ignored, and the stories of so many people are passed by. I want to learn those stories, and I want to share what I learn. So, if you're puzzled as to why I would write about being Black in Old-Time Phoenix, since I'm not Black, I just ask you to look again. And that's all I ask. I'm not telling you what to see, I'm asking you to look. I have given myself permission to look, and to explore. Please come along with me. I resent history written as if certain people didn't matter, or didn't exist. To me, they matter. And I will write about them. We are all who we are, and we can't change that. I am proud of who I am, and I would like to believe that everyone feels that way. My journey of discovery is just beginning, and I have to admit that I'm pretty darned surprised at how much I'm finding about how diverse the history of Phoenix, Arizona is. And if you didn't know, it's not surprising, because it's not that the people weren't there, it just that their stories weren't told. I want to learn those stories, and tell them. 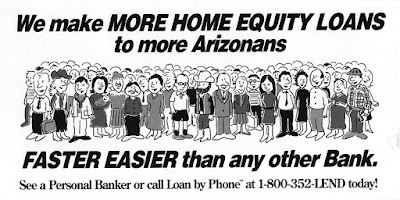 Image at the top of this post: Poster for Bank One from 1994.